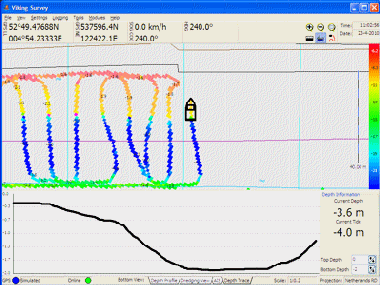 Viking Survey is an extension to Viking Navigation and thus offers the same ease of use and all features already present in Viking Navigation. With added support for an array of hydrographic sensors and equipment Viking Survey is a great addition to the Viking product range. An important aspect of Viking Survey is its ease of use. The interface is divided into logical sections all of which have clearly visible figures. Only the necessary tools and buttons are displayed on the screen, offering a clean and easy to use interface. With support for most echo sounders, realtime sidescan sonar and additional hydrographic equipment. 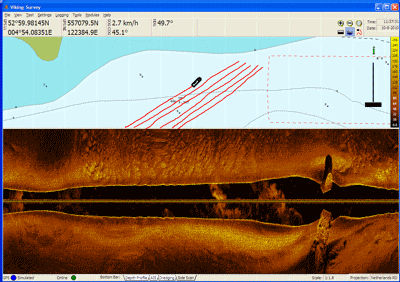 Viking Survey is a great tool for both large and small scale survey projects on virtually any type of vessel.